When a collision occurs in a network using CSMA/CD, how do hosts with data to transmit respond after the backoff period has expired? Why do hosts on an Ethernet segment that experience a collision use a random delay before attempting to transmit a frame? A random delay helps prevent the stations from experiencing another collision during the transmission. In the graphic, Host A has reached 50% completion in sending a 1 KB Ethernet frame to Host D when Host B wishes to transmit its own frame to Host C. What must Host B do? After an Ethernet collision, when the backoff algorithm is invoked, which device has priority to transmit data? Which of the following is a drawback of the CSMA/CD access method? What does the IEEE 802.2 standard represent in Ethernet technologies? • The originating host dynamically issues an arp -a command to obtain the destination MAC address. • The originating host broadcasts an ARP request packet and each host in a local network receives this packet. • The originating host dynamically issues an icmp echo request command to obtain the destination MAC address. • The host with the specified destination IP address sends an ARP reply packet containing its MAC address back to the originating host. • The host with the specified destination IP address sends an icmp echo reply packet to the originating host with its MAC address. 17. Which TCP/IP model layer supports both LAN and WAN technologies? 18. What is the primary responsibility of the transport layer? 19. What is the network broadcast address for a Class C address of 192.168.32.0 with the default subnet mask? • It belongs to the Class A range of addresses. • It belongs to the Class B range of addresses. • It belongs to the Class C range of addresses. • It is reserved for loopback testing. • It is reserved for multicast group testing. • It is reserved for unicast testing. 22. Why is IP considered a best-effort protocol? • IP detects lost packets. • IP validates the content of the packets. • IP does not provide acknowledgment of the data delivery. • IP reorders the packet as they arrive at the destination host. • An ARP request must be used to obtain an address that is placed in the ARP table. • Frames from other hosts in the network to this host will use a destination address of 00-06-25-25-6e-5d. • The only remote locations that can be reached from this host are 192.168.1.97 and 192.168.1.254. • If a packet is sent to a network device other than 192.168.1.97 and 192.168.1.254, an ARP request must be used. • If the computer with the IP address of 192.168.1.94 sends a packet to the device with the IP address 192.168.1.97, no ARP request is required. Refer to the exhibit. Which devices are recommended to have the IP addresses manually configured? 26. Why were private IP addresses developed? 27. Which subnet mask would be assigned to the network address of 192.168.32.0 to provide 254 useable host addresses per subnetwork? 28. When a host has an empty ARP cache, what is the next step the host will take to find the destination MAC address of a remote host? Refer to the exhibit. 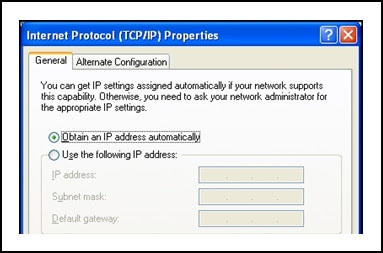 What is the purpose of the Obtain an IP address automatically option shown in the exhibit? 30. How many usable hosts are available given a Class C IP address with the default subnet mask? 31. Which statement accurately describes public IP addresses? 32. Which IPv4 class of addresses provides the most networks? 33. Which IPv4 class provides the highest number of host addresses per network? 34. What is the purpose of a DHCP server on a network? • The LAN segment is subnetted to allow 254 subnets. • The DNS server for this host is on the same subnet as the host. • The host automatically obtained the IP addresses 192.168.1.100. • The host received the IP address from the router on the local LAN segment. • The host is assigned an address of 00-50-8D-F1-EA-8D by the administrator.